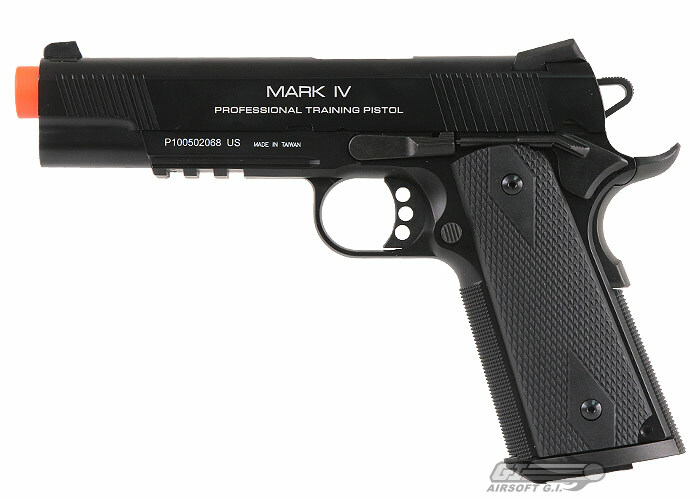 The KWA Full Metal M1911 Mark IV PTP Airsoft Gun is an astounding work of art. The frame and slide are constructed of metal which give the gun a very realistic look, feel, and sound when fired. Aiding in that amazing sound is the metal hammer and stiff hammer and slide springs. 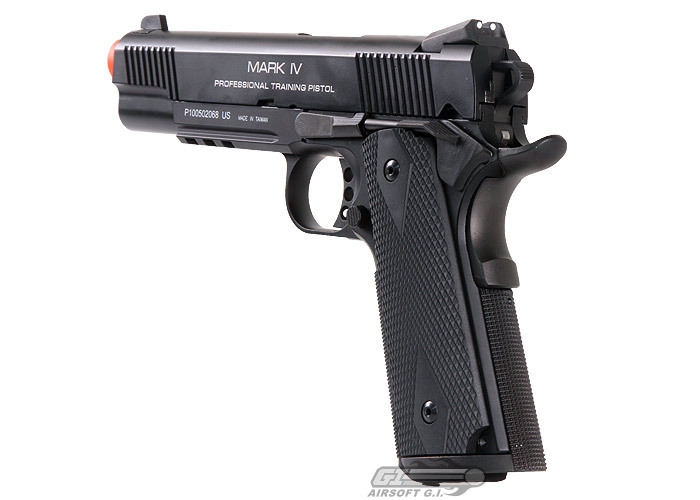 The barrel is conical which eliminate the barrel bushing, the end result is an updated 1911 look. The guide rod sits underneath the barrel to keep the slide on track. The rear sight has dots for faster target acquisition. The grip safety comes complete with a beaver tail to help control recoil and the traditional thumb safety is ambidextrous. The trigger has three holes bored out of it and the hammer is bored into an triangular shape. The frame, below the barrel, features a 20mm rail section for mounting lights or lasers. Finally, to help reloading, the magazine well has been slightly elongated and beveled at the entrance. 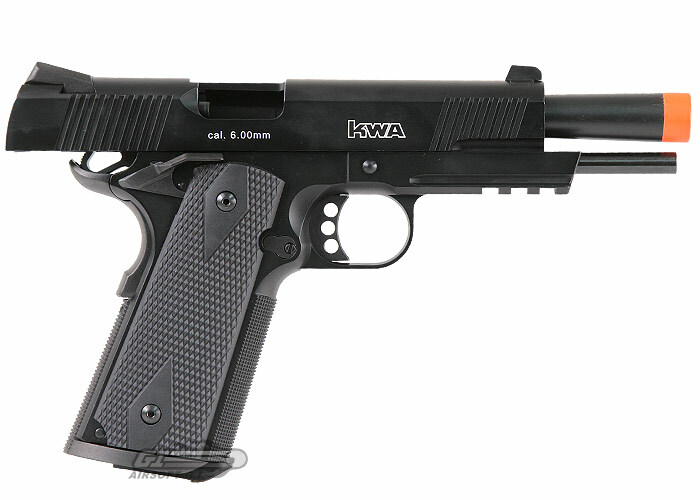 KWA is well known for making some of the highest quality airsoft guns in the world, and this new 1911 definitely ranks up there with the best of them. This is a great gun. It's a blast to shoot, the blow back action is amazing, and it feels great. However, there are a few things that I was confused about with this gun, and my research didn't tell me a lot about this gun. First, when the last bb leaves the barrel, the slide locks back. You can't pull back the slide to release it, you have to flick the slide release. Second, my gun came already built to accept the double stack magazine, and the magazine it comes with is double stack. It holds 21 bbs. I read that it fit 15 in a single stack magazine, but I'm okay with it. I run this with propane and .25 bbs, and it shoots really hard and accurate. I love this gun! 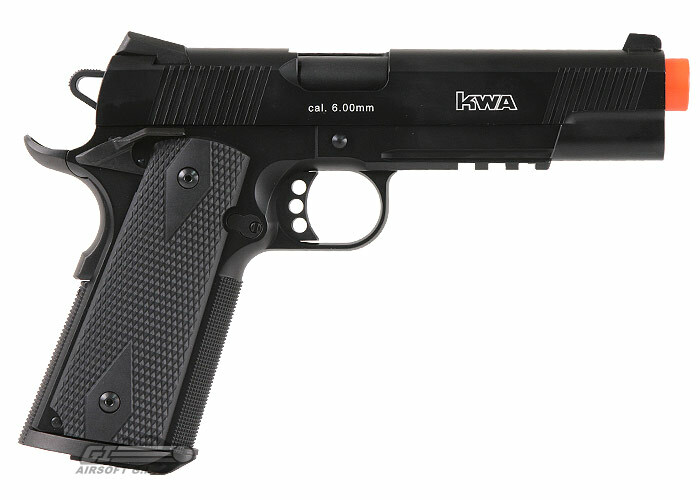 KWA is a great brand. I'm hoping to get their GBB M4 PTR sometime soon, mostly because I've fallen in love with this gun. Buy it, you won't be disappointed. It comes with a small bottle of silicon oil. You can release the hammer with your thumb, and the gun doesn't shoot. However, it stays locked back like a millimeter. If it gets knocked forward, all the gas gets released from the magazine. This happened to me when I buttoned my holster. Full metal except the barrel, but you can get a replacement barrel, which I plan to do. You can shoot it pretty fast, about as fast as you can pull the trigger, but it's really accurate once you've adjusted the hop up, so you don't really need to. Seriously, this is fun to shoot. It has a strong recoil, but not enough to throw off your aim, so you can put a lot of bbs down range, and feel awesome while you do it. It comes with big white letters on the side, just like the picture, which is kinda a bummer, but not that big of a deal. Sometimes, the part of the gun that chambers the bb gets locked forward. I just dropped some silicon oil into it and it started working fine again. I only usually get 1 and a half magazines off of one fill. I've only gotten 2 magazines once. The description's a little deceiving. It's a little back heavy. It feels fantastic, but I wouldn't mind a little heavier of a slide. Not really a con, but oh well. This pistol is really solid and well built. The full metal construction gives it a very real feeling in the hands, and it shoots like a dream. It's very accurate, and the magazines are both high-capacity and gas-efficient. It tends to shoot about 330 FPS with .2s and 300-315 with .25s; the mags are not cheap but I have two thanks to the previous owner I purchased it from. 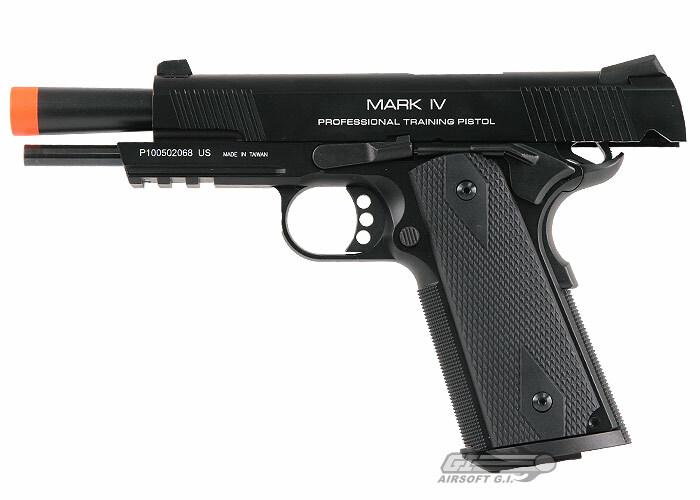 The grips are nice and the Mark IV variety has the best mag well (it cups the mag rather than leaving it exposed). 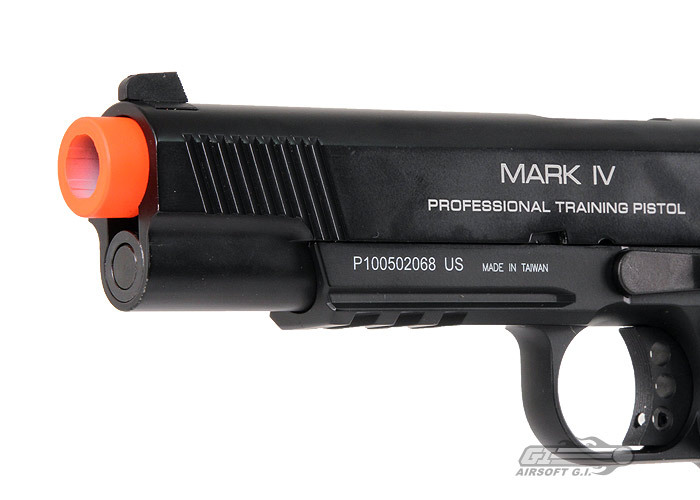 The Picatinny rail featured on this and the Mark II is also great in a pinch. Putting all that together it's a great gun with the KWA brand's quality. I shoot a real 1911 .45 and was looking for a cheaper alternative to practice defensive shooting where I don\'t have to go to a range to shoot and where it doesn\'t cost $.30 a round whenever I shoot. This a great practice pistol to practice drawing and indexing onto the target because its size and angles are exactly that of a real .45. Also you need to get an extra mag to practice mag changes. Great little air pistol. You can\'t really call them \"cons\" because they are just inherent limitations of an airlift pistol when compared to the real thing. It is much lighter than a real .45. I\'m going to get a metal outer barrel to increase the weight. Obviously it does not have the recoil of a .45. It recoils about half the strength of a .22.
can the NS2 system take propane or will it get ruined? 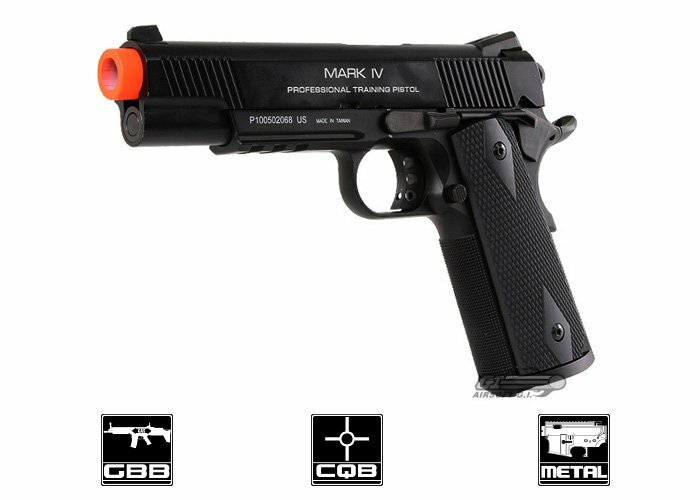 I was looking at getting one of the Mark IV's and a G Code XST holster. Will I need a railed or non-railed holster because it seems to me that the rail would not interfere at all.